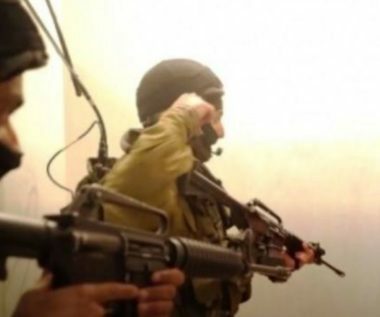 Israeli soldiers abducted, overnight until morning hours, Tuesday, thirteen Palestinians, including five women, and one child, during extensive and violent searches of homes, in several parts of the occupied West Bank. The PPS office in Tulkarem, in northern West Bank, said the soldiers abducted Abdul-Rahman Mazen Abdo, 20, and Yousef Maher Jaber, 21. It added that the soldiers also abducted Wafa’ Mahmoud Na’alwa, 54, and her daughters Hanadi, 26, and Sondos, 20. Wafa’ is the mother of Ashraf Na’alwa, the Palestinian who fatally shot two Israeli settlers, and wounded a third, in the Industrial Zone of Barkan colony, which was illegally built on Palestinian lands in Salfit governorate, in the West Bank. In Nablus, also in northern West Bank, the soldiers abducted Mohammad Rassem Ahmad, from ‘Asira al-Qibliya, southeast of Nablus. The soldiers also abducted Osama Ahmad Salatna and Samir Ibrahim Fashafsha, from Jaba’ town, southwest of Jenin, in northern West Bank. In Aida refugee camp, north of Bethlehem, the soldiers abducted a former political prisoner who was just recently released from prison, identified as Fadwa Abu Srour, 55, and her daughter Yasmeen, and summoned Fadwa’s husband, Abdul-Rahman Abu Srour, for interrogation. The Israeli army has been repeatedly invading and searching the Abu Srour family home, and recently abducted Fadwa’s and Abdul-Rahman’s son, Khalil Abu Srour. In Hebron, in the southern part of the West Bank, the soldiers abducted a former political prisoner, identified as Mamdouh Ibrahim Abu Rabea’, and Tamer Sami al-Badawi, only 14 years old. In occupied Jerusalem, the soldiers abducted a former political prisoner, identified as Mahmoud Abdul-Latif, from the Old City.